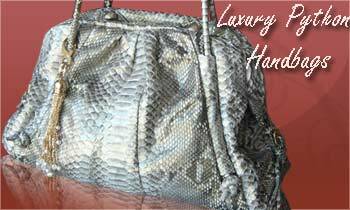 Luxury python bags: the fashion style of spring- summer 2009! 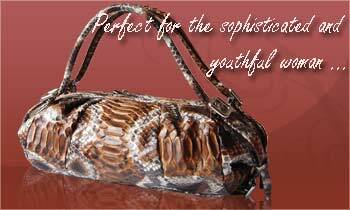 The key word of spring- summer 2009, as far as fashionable handbags are concerned, is “python”. Always considered a sign of elegance and prestige, this leather is looking all set to enjoy a very positive season, and has been re-discovered and celebrated by the best known designers and by world famous producers of handbags and leather accessories. Python handbags embody the perfect fusion of elegance and exoticism, a gorgeous combination that gives a vivid touch of charm and prestige even to the simplest accessory. Python leather, with its textured irregular scales and its luminous colors can transform a classic leather bag into a work of art of excellent manufacture, a very high quality product which can transform your image, making you look even more stylish, but at the same time absolutely elegant. Every bag, every accessory made from this soft, supple skin is extremely light and amazingly comfortable to wear and if the python skin is really high quality, your handbags will last in perfect condition for many years, always retaining the same beautiful looks and softness they had on the first day you bought them. A python bag is beautiful to look at, very soft to touch, and wonderfully comfortable and light to wear but, don’t forget that it is also an investment for the future! It certainly has a higher value and price than the classic leather bag, but it is a purchase you make just once or twice in your life and is a product which you will always use and that, if well looked after, lasts a life time. Even those few particular qualities of python skin that we’ve listed above should be enough to convince you to buy a genuine python bag, but, as we announced at the beginning of the article, besides its prestige and its fine quality, for spring – summer 2009, a python bag will be the ultimate in fashion and luxury, and you will find them in a huge range of attractive colors. Classic colors such as beige, brown and black, will be very trendy, as always the sign of classic elegance. Plus as three neutral shades, they all go perfectly with any other color and with every style. Besides these “universal shades”, which are perfect both in winter and in summer, we find more definite summer colors such as light pink, green and blue, in all their many shades. But what are the most fashionable styles? The classic python shoulder bag continues its success as a perennial style, with either a fine or more comfortable wide python strap, which is sometimes detachable, transforming the bag itself into an even more refined and gorgeous special occasion purse. The classic model, however, is given a new twist with the application of decorative elements such as flowers made of the same python leather as the bag (as presented by the designer Valentino Garavani) or golden decorations at the front of the bag, as well as pendants and small chains. The style always remains classic but it is revitalized by an original touch in colors or accessories. For those who love being trendy, without sacrificing comfort and practicality, Gucci has decided to re-introduce the classic rucksack with many external and internal pockets and compartments, two shoulder straps and a small handle so that you are free to choose whether to carry this bag in your hand or to wear it as a regular rucksack. The defining element of this style is contributed by the gorgeous python leather it is made of, a refined play of color shadings which add charm and elegance to this practical model, despite its casual style. You handbag must be decorated with accessories such as pendants, crystals or flowers and bows made of genuine python skin. By following these two simple suggestions, you will transform your summer into a festival of color and elegance. Be trendy with style!! !